Almuth Tebbenhoff studied ceramics at the Sir John Cass School of Art from 1972 to 1975. 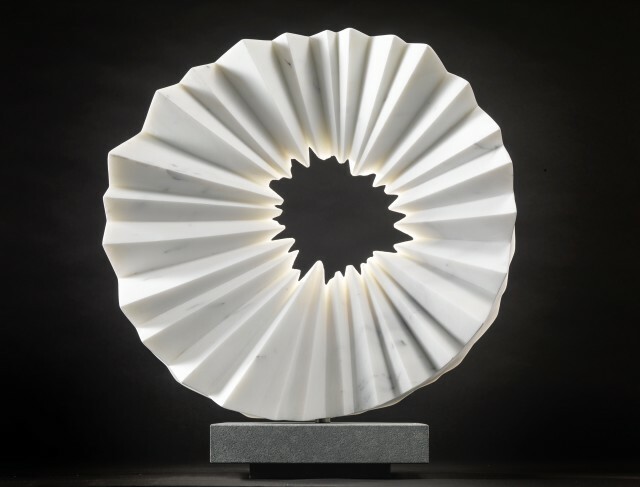 In 1981, she established her Southfields studio in a former church hall to pursue sculpture, first working in clay and wood, before studying a two-year course in metal fabrication at South Thames College, London. Elected Fellow of the Royal British Society of Sculptors in 2002 and winner of the London Group Open Prize for steel sculpture in 2015. Her early pieces were monochrome, mostly grey, abstract explorations of space and volume through geometric devices. In the nineties, she moved towards a freer mode of expression, creating explosive forms in bright colours through a steady evolution of processes, investigating themes of light, space and the origins of matter. This recent work returns to organic colour and form. Almuth Tebbenhoff is inspired by process: she loves the way objects of beauty and intrigue can emerge from a noisy session cutting and welding steel, sparks flying in every sense, or from a quieter but no less messy afternoon pushing wet clay around. It’s the simple fact of working with her hands to distil from dull, reluctant matter pieces that are always interesting, always challenging, invariably searching, frequently witty, often profound, and sometimes breathtakingly lovely. It is this physical labour of art that draws her restless spirit to sculpture. The Breakthrough Cube series are Almuth's latest pieces. No 1 is in the Ark exhibition at Chester cathedral. No 2 is going in the ceramic and stone show at Pangolin London and No 3 is coming to Candida Stevens Gallery as part of Good Nature in September 2017.